Have you had the experience, upon finally closing a book, of being speechless? Or being deeply grateful (and perhaps envious) because someone had both the capacity to think so clearly about a fundamental topic and the good fortune to have the support needed to make a book flawlessly engaging and imperative? 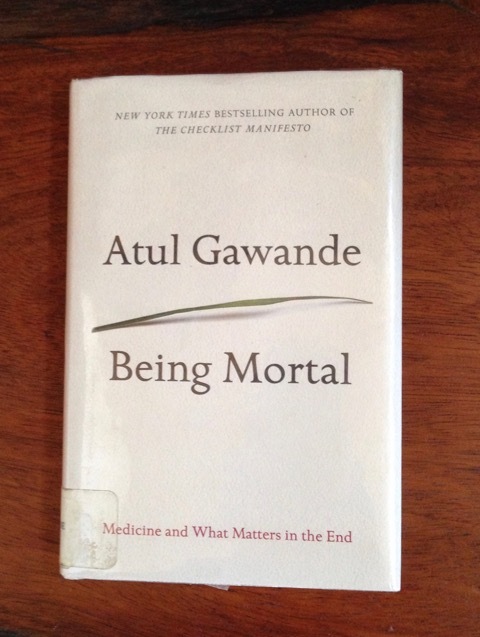 I recently finished Atul Gawande’s Being Mortal: Medicine and What Matters in the End. I know it has won accolades and been on the NYT best seller list for months; I know I’m just one in a long line of people to acclaim it. But it’s important enough to me that I want write a bit about it here, in the hopes that anyone who reads this will go to the library and check it out. Don’t miss this book, regardless of your age. Published in 2014, it’s a book about aging and dying, about unsung heroes and heroines in our country who have seen the pain and shame of the our medical and care-taking systems and done something about it, and about a doctor’s-eye view of the choices, wise and foolish, made by both medical personnel and families. In reading it, I was led to reflect in a new way on significant things in my family: on how it must have been for my father to die in a nursing home after days of pain he once characterized as 15 on a scale of 1-10; on how it perhaps will be for my mother, now 99, to die in that distant nursing home without most of her children present; on what I need to put in place for myself and my old age and my death; and on the fact that I want my brothers, my friends, my daughter, her husband, and my grandchildren to read this book, too, so we can all be on the same page when serious illness or death shows up in our personal experiences. So we can have the difficult conversations. Gawande is a masterful story-teller and one theme of his book is how crucial it is to each of us to fashion our own story at the end of our lives. “For human beings, life is meaningful because it is a story….And in stories, endings matter.” (p 238-9). Gawande repeatedly returns to the point that in discussions of end-of-life care and dying, there are things more important than safety and length of life (which are the concerns that dominate the medical world). “No one ever really has control. Physics and biology and accident ultimately have their way in our lives. But the point is that we are not helpless either. Courage is the strength to recognize both realities. We have room to act, to shape our stories, though as time goes on it is within narrower and narrower confines. A few conclusions become clear when we understand this: that our most cruel failure in how we treat the sick and the aged is the failure to recognize that they have priorities beyond merely being safe and living long; that the chance to shape one’s story is essential to sustaining meaning in life; that we have opportunity to refashion our institutions, our culture, and our conversations in ways that transform the possibility for the last chapters of everyone’s lives.” p 243. Being Mortal is structured as narrative—Gawande’s personal story; the story of his India-born doctor-father’s last illness and death; the poignant stories of people he interviewed in the course of research; and stories of inquiring about nursing homes, retirement arrangements, hospice, medical institutions and doctors’ conundrums, and debates and laws in the arenas of aging, disease, death, and dying. Gawande is a reformer-researcher, informing us about people who have dramatically increased our access to options and re-imagined how aging could be. One example that grabbed me was a chapter is devoted to fearless Bill Thomas, a medical doctor who took over a nursing facility in New York state and made radical changes (including establishing multiple dogs, cats, birds, and plants in the facility). The results of his work: significant reduction in prescription meds and residents’ death rate, and increase in happiness and independence. It was all important and new information to me. Another thing this book gave me is some meaningful questions to ask a loved one when he or she is close to death. Gawande credits to a wise practitioner for teaching him these; I wrote them into my journal before I thought of writing this blogpost, and regrettably I did not note the page numbers in which they appeared. Which means you’ll just have to read the book yourself to get the context for them! What do you understand your prognosis to be? What are your concerns about what lies ahead? What worries you? What kind of trade-offs are you willing to make (regarding medications and life-extending procedures)? How much are you willing to go through to have a shot at being alive (i.e.,surgery, extreme measures)? When do you want to switch from fighting for time to fighting for other things you value? Finally, in reading Being Mortal I started to rethink where I’d like my ashes to be sprinkled, for I have chosen cremation as my preferred mode of disposition. Gawande took his father’s ashes to the middle of the Ganges River and performed a Hindu ritual there. Now I’m finding it kind of fun to contemplate what kind of travel my family members might get to undertake in carrying my ashes to places I love. Hmm…. The Himalayas in India where I grew up? the Camino de Santiago in Spain I’ve walked thrice? the Prana gardens of my spiritual community? the plains of Kansas where my parents have graves? the Neva River in St. Petersburg which I once fell in love with? But of course, the real bottom line for me in the question of where to dispose of my ashes is totally their choice. Under a purple-blossoming jacaranda tree in springtime in Los Angeles would be just fine, too.